Hydrogenambassadors (by Arno A. Evers) - It`s all about Energy! How to Build a Supergrid? Move electrical energy to the PoS - NOT fuels! 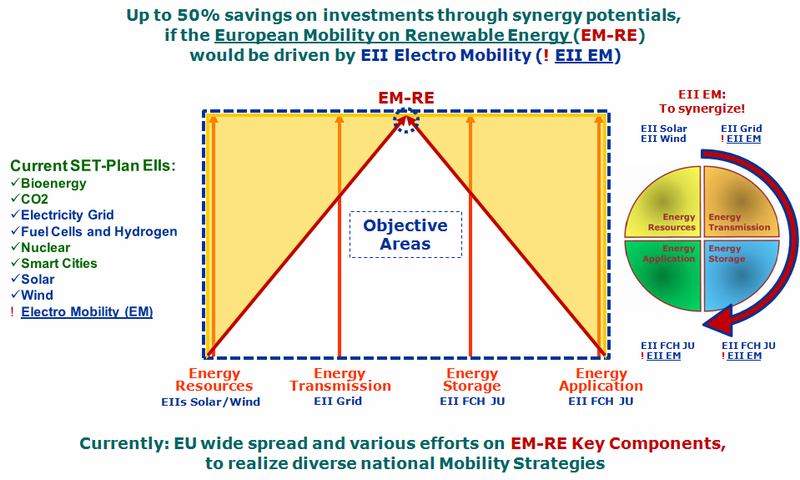 European Mobility on Renewable Energy! shall be implemented on a Network of 10 initial European highways. A new installed Via Azul Energy Supply Grid (ESG) on the initial highway network will connect renewable energy sources with new generation fuelling stations, equipped with facilities for local energy storage and charging/fuelling of electric and Fuell Cell vehicles (Battery and Fuel Cell). The Via Azul consortium will drive at the same time the establishment of local e/FC vehicle fleets, enabling short term ROI for the to be implemented new energy supply, storage and charging/fuelling infrastructure. 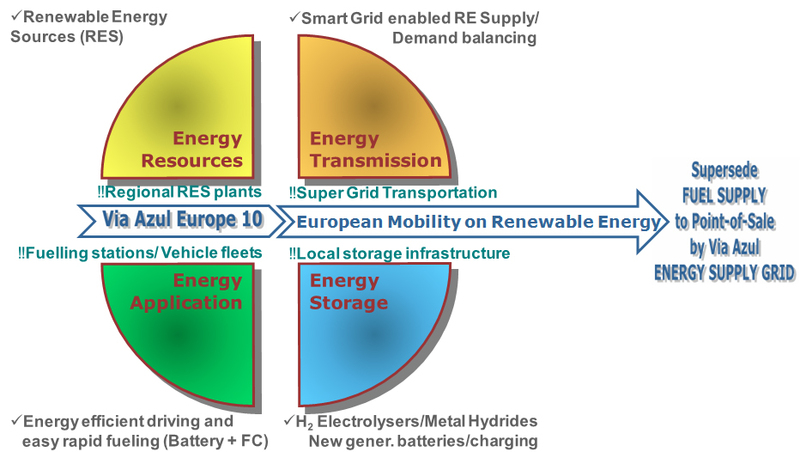 The ‘Via Azul Europe 10’ initiative focuses on a solution approach for an European Highway Network of a new fuelling station generation, equipped with facilities for local energy storage and supply to electric propulsion vehicles (Battery and Fuel Cell). A new installed Via Azul Energy Supply Grid (VA ESG) on a network of 10 initial highways will connect renewable energy sources with the fuelling stations. The Electrical Energy Transmission to the Point-of-Sale (PoS), realized through the VA ESG and applying the HVDC/AC buried cable technology for its Wide Area Network, can substantially shorten line approval cycles, if this WAN will be implemented along 10 VA Highways. Complementary DC/AC Local Area Networks (LAN), amplified by local RES and H2 supply, enable charging/fuelling every 50 km. The VA ESG components: VA Smart Grid (electrical WAN/LAN) and VA Hydrogen Grid (local Hydrogen supply) will be extended by an Energy Dispatching IT-Network, to assure real-time information exchange about decentralized renewable energy generation vs. local demands, to enable an efficient supply/demand balancing at any point in the network. 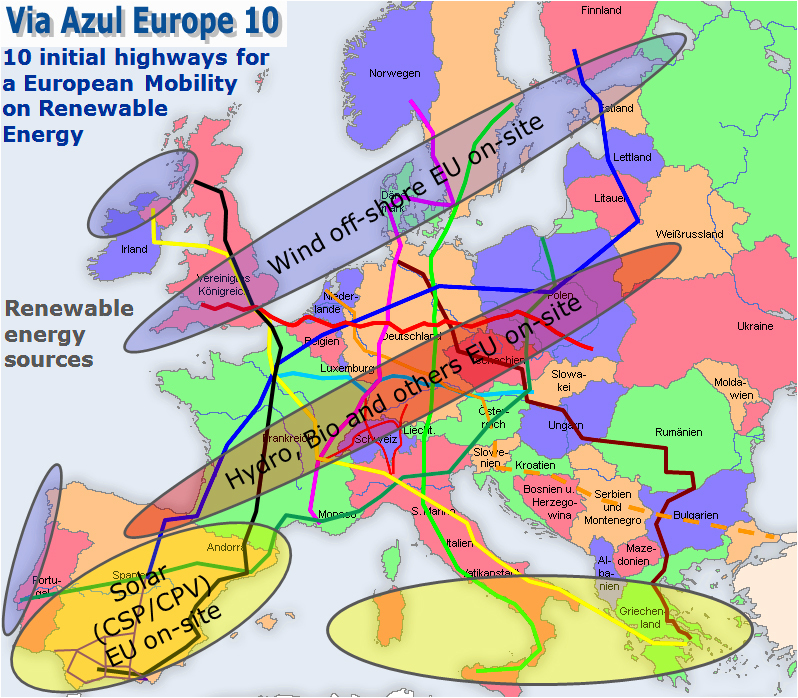 The Via Azul Europe 10 initiative will enforce the assembly of the Critical Mass for an European Mobility on Renewable Energies. The Critical Mass is considered to be represented by the energy efficient continuum of the Via Azul Quadrants: Energy Resources, Energy Transmission, Energy Storage and Energy Application. The BENEFITS FOR EUROPEAN ECONOMIES will be tremendous, not only in AUTOMOTIVE AND THE SUSTAINABLE ENERGY SECTOR, but overwhelming in the SECTOR OF TRANSPORTATION, the bloodstream for each economy. The common benefits would be even more groundbreaking, when the Smart Grid will be connected with DESERTEC resources, providing high pike energy generation cycles among shifted European time zones. For more details go to section Thesis on the Via Azul Website..! See some more related background info on the right of this page..! Via Azul to enforce a SET/STT-Plan EII ‘Electro Mobility’..? The further development of some Via Azul relevant renewable energy technologies are now driven by distinct European Industry Initiatives (EII) under the EU SET Plan (European Strategic Energy Technology Plan) or STT Plan (European Strategic Transportation Technology Plan). The proposal for the VA Feasibility Study has been submitted in the context of the ERA-NET Electromobility+ Call, at 2011-03-31..! *10 initial highways, to be implemented in 10 years by 27 member states. Figure incl. Energy resources, Smart Grid, Fuelling infrastructure, Initial city/urban FC Bus fleets and Project Mgmt. and energy	efficiency in the transportation sector..? 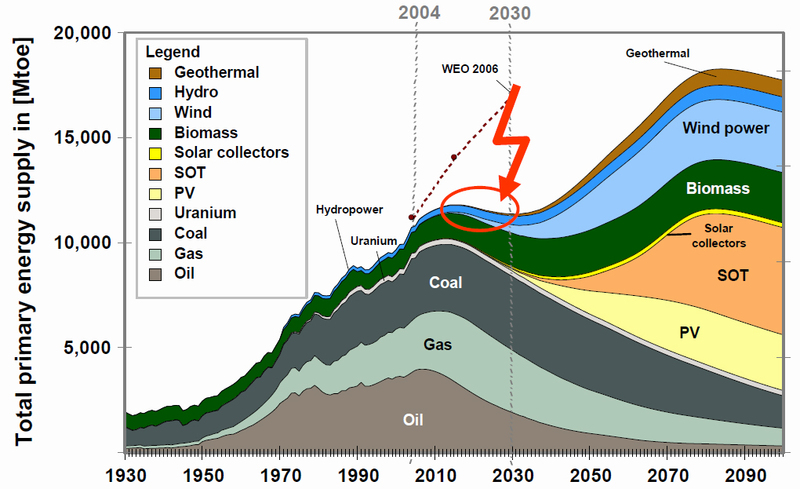 Global Warming, CO2 emissions, primary energy supply (Peak-Oil), alternative energy outlook and the stimulating iea ETP 2010 BLUE MAP scenarios, ..! Current energy and CO2 trends run directly counter to the repeated warnings sent. Conclusion: Reductions of at least 50% in global CO2 emissions compared to 2000 levels will need to be achieved by 2050 to limit the long-term global average temperature rise to between 2.0oC and 2.4oC. 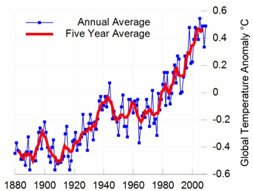 Recent studies suggest that climate change is occurring even faster than previously expected and that even the “50% by 2050” goal may be inadequate to prevent dangerous climate change. 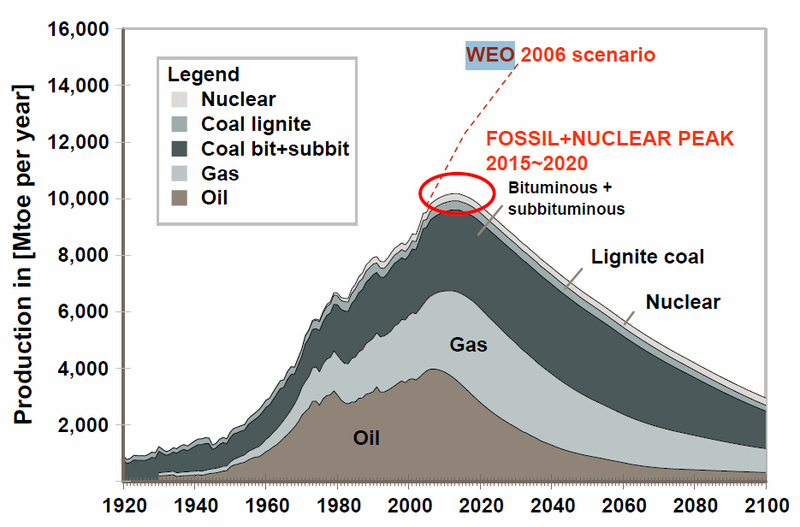 Outlining how CO2 emissions could be reduced to 50% below 2000 levels, to limit global warming at <= 2oC. 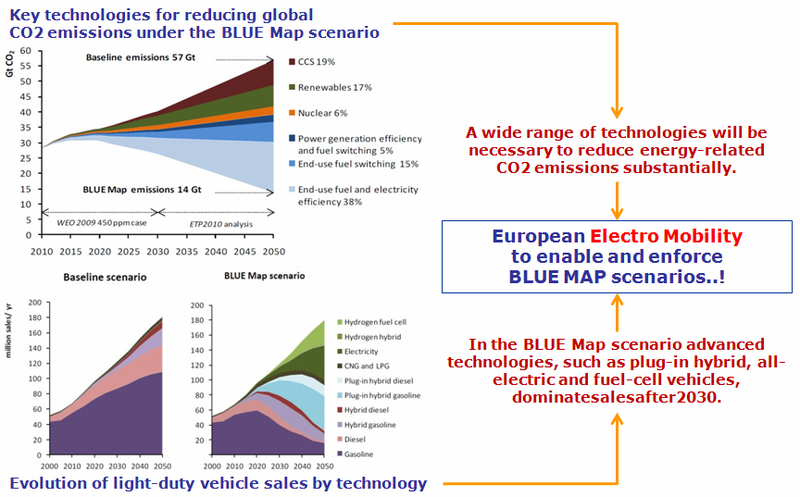 "Via Azul focus: Electro Mobility at CO2 emission reductions..."